Now you need to use your search strategy with your selected sources to find the information you need. Many of the sources you need can be found via the library website. The table below outlines where to look on the USC Library Website to find the specific sources. Sometimes a source can be found in several places. Discover lets you search the majority of the Library's collection in a single search. Go to the Library website and select Login for Full Access. Select USC Students and Staff and enter your username and password is prompted. Type your keywords in the DISCOVER search box. Remember to use your search strategy (combine keywords with Boolean operators, phrase searching and truncation). Go to the library website and select Login. Select USC Students and Staff and enter your username and password is prompted. Select the Catalogue tab and type your keywords. This is an Advanced Search. Select the field you want to search (Title, Author, Subject or Any). 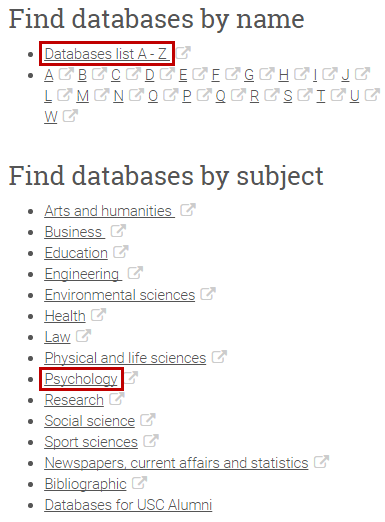 Go to the library website and select the Journal Titles button. Type the title of the journal (may appear in italics in a reference list) into the search field. N.B. Do not type the title of the article. Select Full text available and select the database that includes the appropriate year range. N.B. Some databases don't include this year's articles. Once in the database, select the specific volume and issue number for the article you need to find. Go to the library website and select Login. Select USC Students and Staff and enter your username and password is prompted. Select Course Reserve and type your course code into the search bar. Use this search to find a reading from your Course Readings that you can't find in the Catalogue or in Journal Titles. You can search by Course ID, Course Name, Instructor Name or Title. Refer to Blackboard if you cannot find your course listed.